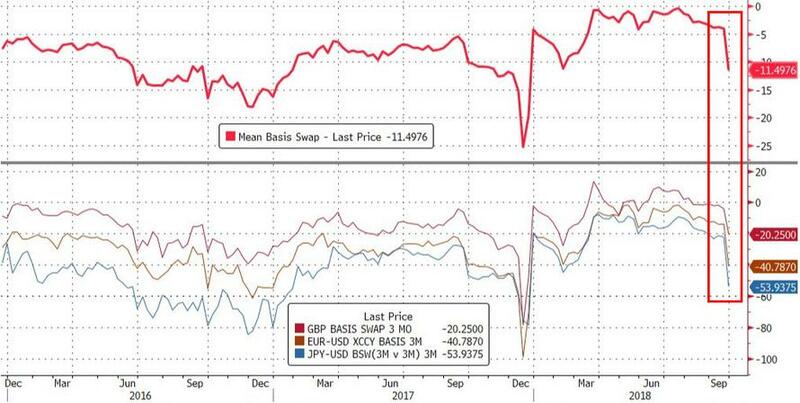 Late last week we highlighted the sudden spike in various dollar basis swaps (i.e. funding costs) amid what appeared to be a widespread, dollar shortage, and judging by the sharp spike in the dollar in the days after, there indeed may have been a scarcity of greenbacks in the market. In a subsequent post, we also explained that the reason for these sudden increases was the fact that as of last Thursday, the three-month FX forward contract extended over the year-end for the first time this year. It spiked wider, i.e., became more expensive, because banks, and in particular foreign banks, make an effort to minimize their balance sheets on December 31st for regulatory reporting purposes. As a result, according to BofA these FX hedging costs will likely remain elevated for the remainder of 2018 and normalize on the first day of the new year - a pattern that repeats every year. 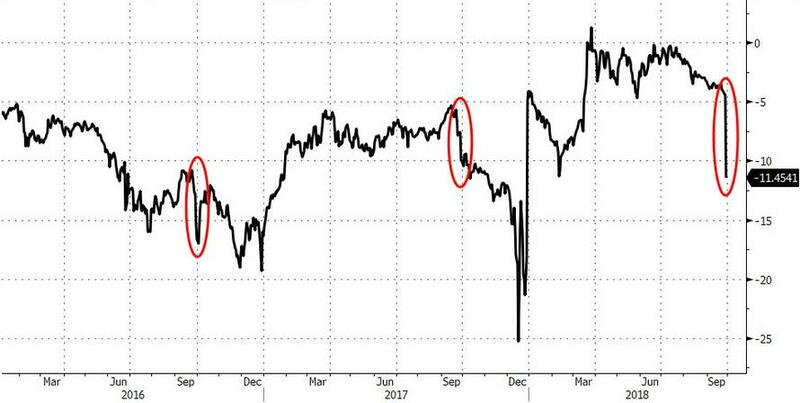 More importantly, we said that one consequence of this basis swap repricing is that USD-denominated treasuries suddenly became far more expensive to hedged foreign buyers to the tune of roughly one rate hike. "Which, all else equal, would mean that there is now that much less demand by international buyers for TSY paper on the long end." Rhetorically, we asked, "could this shift in supply-demand mechanics impact the yield on long-dated paper?" Judging by the dramatic steepening in the yield curve, and violent repricing higher in yields across the curve, the answer was yes. 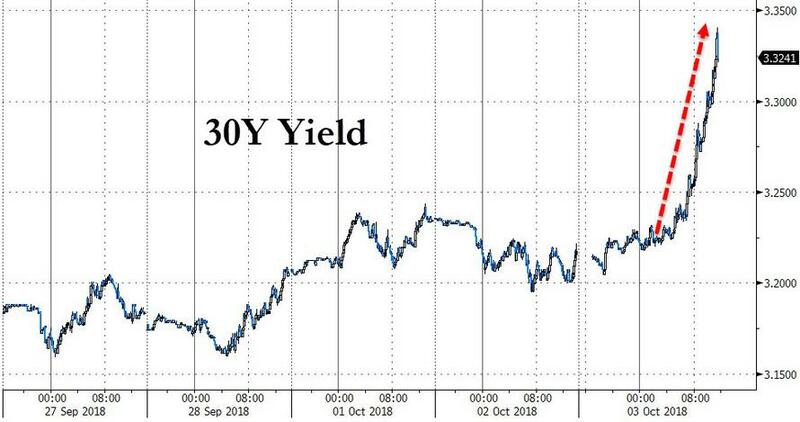 Today, none other than Bill Gross echoed this sentiment, and on the day where yields on 10- and 30-year Treasuries surged to multi-year highs, Bill Gross explained the sharp drop in US paper as a result of dimming demand from foreign investors." Why is demand dimming? The same reason why noted above: a jump in hedging (or funding) costs. 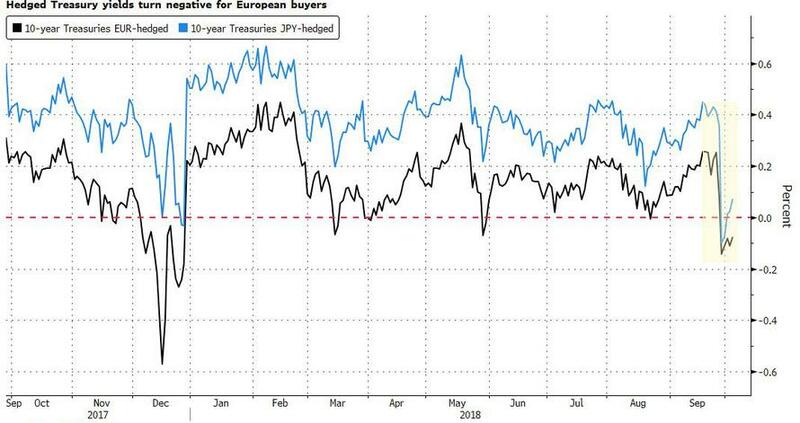 Gross: (1 of 2) Euroland, Japanese previous buyers of 10yr Treasuries have been priced out of market due to changes in hedge costs. As we explained last week, Gross was referring to the falling cross-currency basis, which has driven U.S. 10-year equivalent, or hedged yields to -0.06% for European investors and 0.09% for Japanese buyers who hedge against currency fluctuations through swaps, as the following Bloomberg chart shows. This means that net of hedges, US Treasuries yield less for Europeans and Japanese investors who instead can make 0.47% for 10-year German bunds and 0.13% for similarly dated Japanese government debt. Here's the math: for a euro-based buyer of Treasuries, the cost to hedge would mean paying the 3M USD LIBOR (currently about 2.41%), receiving local € Libor (-0.35%) and the basis (0.39%). As the three-month cross-currency basis blows out, largely driven by the rising Fed Funds rates and positions through year-end, that hedge becomes more expensive. And, according to Gross, the carnage may not end here: "Lack of foreign buying at these levels likely leading to lower Treasury prices," echoing what we said last week. And as foreign investors pull back from US paper, look for even higher yields, and an even higher dollar, which in turn risks re-inflaming the EM crisis that had mercifully quieted down in recent weeks.